The competition is fierce, so how are the two smartphone rivals building their communities? 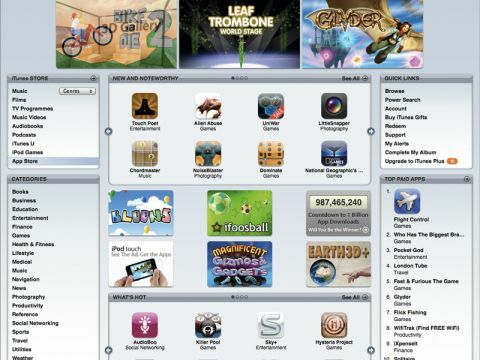 Apple's App store is a beautifully designed shop whether you access it on your phone or via iTunes on your computer. All of the features you might reasonably want are included: user reviews, screenshots, a decent search engine and easy browsing via different categories. On your iPhone or iPod Touch it also notifies you of any updates to your installed applications, with an Update All option to take the drudgery out of downloads. With over 25,000 applications to choose from you're spoilt for choice, and prices are reasonable: there are plenty of free apps, and simple utilities tend to be less than £2. Even complex packages such as QuickOffice aren't too pricey; if you want to work on the move, it only costs £11.99 to do so. What's particularly interesting about the App Store is the big names found on it: Ebay, Skype Sky, Google, Last.fm and Facebook are all there. Even Microsoft is getting in on the act: it already offers two applications, and reports suggest it's working on a stripped down version of the Office suite. The big downside to the App Store is how Apple controls it. The company's quality control means you're unlikely to buy a dud, but it also limits what developers can do. You won't find anything that rivals any of Apple's own applications, and Apple won't sell things that it deems inappropriate. This can be troublesome, but as of yet the policy hasn't appeared to damage the community too badly.